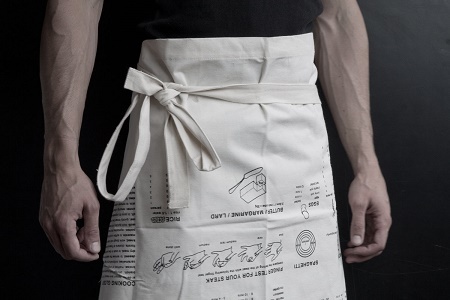 Wearing an apron when making food at home doesn’t seem to be such a common practice anymore. Mainly because most of our food is pre-made, and heated in the microwave. It seems almost comical to wear such an old-fashioned piece of cloth, but if you’re making something from scratch, there’s a good chance that it will be your only hope of protection from a barrage of flour, egg, or anything else that might explode and get on everything. If you’re not an avid chef, but do occasionally enjoy whipping something up, then you might enjoy the Apron Cooking Guide. It has defrosting times, conversions, and several other types of helpful tidbits that will prevent you from going to your smartphone for every little thing when following a recipe. If you are sneaky enough, it will seem as though you have remembered every conversion and cooking time there is. Of course, most of us don’t have that kind of talent, and will end up pulling the apron very close to our faces and inspecting the tiny bit of information that we need. While this isn’t currently up for grabs, it will be soon and will cost $20. If not for yourself, this would be a great gift for friends or family who are new to the world of cooking. Just make sure you don’t get it so dirty that you can’t read the fine print. Putting in a tablespoon of salt when it only asks for a teaspoon can be a dreadful thing.